This is a simple yet core function of the Narrative1 system that moves data from Excel to Word. Synchronize with Excel. This means getting field and table data from Excel - the process only runs when there is new data to get. If "Save Fields & Tables" has been run in Excel since the last time "Merge Fields & Tables" was run in Word, Narrative1 will will get the new data. A "Synchronizing" message will appear when this is happening. Merge fields. Field data is always merged as text, such as dates, values, descriptions, etc. Merge Tables. Tables are Excel ranges, such as grids, comps sheets, etc. If there are duplicate sheets in Excel, multiple Sales Grids for example,merge tables will run more than once. Merge Maps. Maps are automatically generated with Google Maps for the subject and comps. 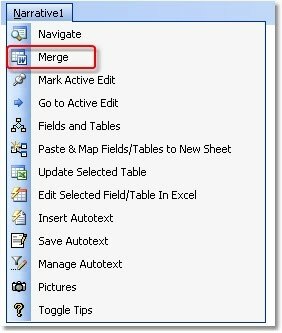 Note: Merge Fields will always merge the last Excel file that ran "Save Fields & Tables". Merge with the wrong Excel file? No problem - simply run "Save Fields & Tables" from the correct file, then re-run Merge Fields in Word. FYI: The data only moves one way, from Excel to Word. Use "Edit in Excel" to move from Word to the source field/table in Excel. 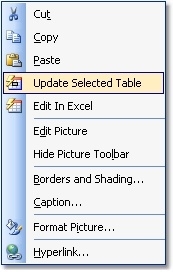 Simply right-click on the selected table and select "Update Selected Table". This action is also available from the main Narrative1 menu in Word.